When we were booking our flights back to Canada, yes, those ones, the ones where we move to Canada, to live, we had a few factors to consider in choosing our return date. Ken wanted to finish his frisbee season and I wanted to finish fixing my knee, and of course we wanted to maximize our consumption of cheap steak and wine. And then there was the World Cup. Eight years ago I watched a World Cup game at 4 a.m. in a Korean BBQ restaurant in NYC. In 2006 I may have snuck out of work on occasion to watch a game (...sorry, Kate) at the local pub with a few other truant souls. But nothing can compare to the experience we've had here in Argentina in the past month. During Argentina's games, the streets were empty. Every time the team scored, we muted our TV and opened the windows to hear whoops of joy (and the occasional vuvuzela) from our enthusiastic neighbours. We watched games with friends, in bars, in parks, and sometimes in our pajamas in bed. We smiled when we saw festive white and sky blue stripes decorating every window and balcony in the city. We made pancakes and toasted the selección with Bloody Marys. And we understood completely when our porteño friend described the national team as "an illness" for Argentines. We also rooted for the United States, and even England, and donned orange shirts for the Spain-Holland final. 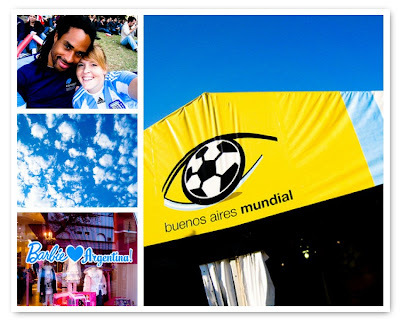 But we stayed in Buenos Aires to cheer for Argentina, and we caught the fever, too, the one that makes your heart beat a little faster when you see Maradona kissing his rosary on the sidelines and feel a little bit bursty when you watch Messi deftly handle the ball through half a dozen defenders. It's the fever that makes you root extra hard for Carlitos Tevez when he's barreling down the field 85 minutes into the game, with just as much energy as he'd had only 5 mintues in, and cheer a little bit louder when Palermo scores his usual goal when he's subbed in with only 15 minutes left in the game. And no matter where we're watching in 2014, our hearts will be with the selección. Vamos Argentina!